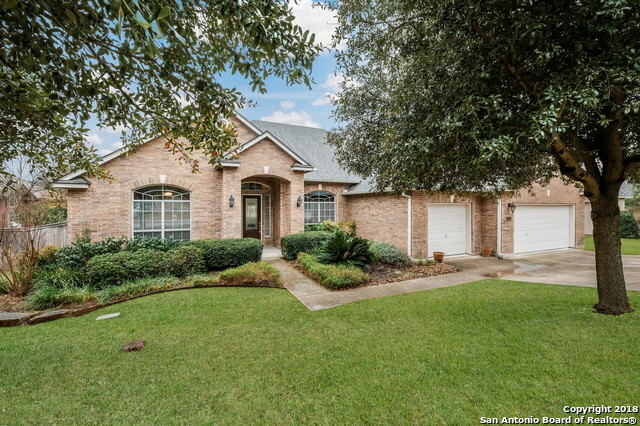 All Point Bluff homes currently listed for sale in San Antonio as of 04/26/2019 are shown below. You can change the search criteria at any time by pressing the 'Change Search' button below. "Experience luxury and style with this 4.3.5.3 home built by Monticello. Designed with lower living areas of 3 bedrooms and 2.5 baths, a large family room with stone fireplace, formal dining, study, and a stylish gourmet kitchen. Upstairs has a 4th bedroom and bath with state of the art theater room that comes complete with furniture and the theater system. Outside, you can relax under the covered patio with custom decking and a view of your very own Putting Green for great entertainment." "Spacious 4 bedroom ranch style home in Point Bluff! Open floor plan with front office/study and lovely fireplace in family room. Gorgeous kitchen with granite counters and all new appliances including double ovens. Wonderful master suite with double trayed ceiling. Master bath has whirlpool tub, two separate vanities, large stand up shower and walk in closet. Beautiful backyard with deck and mature trees. Home also includes water softener and alarm system. $2000 allowance towards a new cedar pla"